Blackjack is a popular card game which is also called 21, because a player must be able to beat the dealer by having a higher hand which should not be above 21 point still higher than dealer has. Here, face cards - Jack, Queen and King are counted as 10, while Ace may either be equivalent to 1 or 11. Other cards are equal to their numerical value. A player who wants to play blackjack online or at casinos must know the basics of the game, and some of the common terms used while playing it. He must also be aware of the various options he has in order to play it successfully. These options are needed because a player may not always be lucky enough to receive an ace and a 10 card. If he knows his options, luck may still be on his side. Among the moves a player must know in blackjack is surrender. From the term itself, it means turning a hand without playing, but may cause him to forfeit half of his bet. Surrendering is allowed after giving the first two cards, while there is nothing done on it yet. If hit is given, or double down occurred, surrender is not allowed. But this options may be the move most players would avoid doing. In every card game, no guts, no glory. In fact, experts do not encourage surrendering. Another option for playing blackjack is to hit, or to ask for another card. This may happen if the hand received is far from reaching 21. 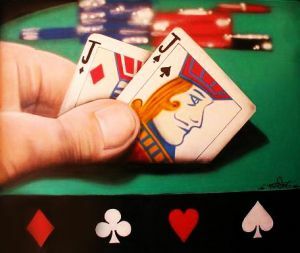 However, players must remember that their hand should not exceed 21, which could be the challenge in hitting, because their final hand may be lower than the original pair if it exceeds 21. If a player receives two equal value cards, he has the option to “split” it up. It means he can make these two cards into two separate hands that are played independently. Once you decide to split up, the cards will be separated by the dealer and two cards will be dealt to pair it up to the split cards. They are now treated as two separate hands, and thus, additional bet is required. It is a good idea to split cards such as 2 eights, which are equal to 16 and take chances at other cards again. However, if a good hand is already received, then splitting would not be good option. Double down is blackjack option wherein a player may be allowed to increase the initial wager twice and receive another card. However, this is a one-time option during the game. This action involves a big risk because once the additional card is dealt, the player has no other options but to stand with it. Most smart players decide to double down when their cards are counted to 11. This is a good card because most cards are equal to less than 10 and the chances to reach 21 is good, and even if the hand doesn’t reach 21, it will still be a good hand.